Pollution, deforestation, poor working conditions: these are the dark spots on the banana-growing industry. The fruit's sweet taste and sunny hue is a stark contrast to the high environmental and social costs it extracts in many Latin American countries. Whole Foods Market (WFM) is trying to change that with every banana it sells. The company has a long-running partnership with EARTH University. 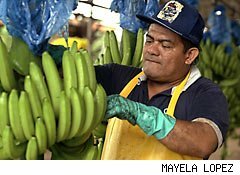 This non-profit international school is based in Costa Rica, which has suffered from deforestation and pollution related to banana production. Every one of the EARTH bananas Whole Foods sells goes toward funding the university. Through Sept. 30, Whole Foods is sowing interest in the university's mission by running a contest that will send five winners to Costa Rica to "study abroad" for a week at the university. EARTH prepares students to become leaders in sustainable farming, responsible business practices, and community development. Its students, hailing from low-income, rural regions of the planet, are chosen for their desire to return to their countries and implement the university's lessons in how to catalyze positive social, economic, and environmental change. This initiative with EARTH University is part of Whole Foods' Whole Trade mission, which requires suppliers to be certified in fair wages, safe working conditions, and environmental sustainability. Environmentally devastated areas hurt people, communities, businesses, and, in the long run, economies' viability. Long-term investors should appreciate Whole Foods' push for a positive purpose as well as profit. Today's consumers increasingly care about companies and products that produce a better world; the 2009 Edelman "Goodpurpose survey" showed that a majority of consumers love to see both purpose and profit. The survey yielded fascinating data in this regard: 83% of respondents reported willingness to alter their consumption habits to improve the world, while 61% admitted to buying brands that weren't the cheapest ones available, but which supported a good cause. Products that support good causes and lofty purposes may provide a new value proposition for many consumers. These bananas in particular, and other offerings like them, should harvest a bright future for Whole Foods and its shareholders. Motley Fool analyst Alyce Lomax owns shares of Whole Foods Market. The Motley Fool owns shares of Whole Foods. Motley Fool newsletter services have recommended buying shares of Whole Foods.